Eloping in New Orleans is a very popular choice for many couples, with numerous fantastic locations available. This adventourous couple wanted to do something a little different when they decided to elope to New Orleans. The wedding itself would officially take place later in the day at the Algiers courthouse, but they wanted a very early morning portrait session by the Tree of Life in Audubon Park. I had photographed weddings at the Tree of Life before, but never early in the morning. This ancient and massive oak tree was the perfect spot, and starting our elopement portrait session literally right at the crack of dawn gave us some beautiful light to work with, and also meant that the park was not very busy, and aside from an occasional jogger and one other photographer who showed up to grab a few shots of the beautiful scene, we had the area to ourselves. The delicate mist that hovered over the ground that morning greatly enhanced this truly magical setting and made for some unforgettable images (and also provided the benefit of obscuring some homes and vehicles that otherwise would have been in the background from this angle). This shot of the couple enjoying a picnic breakfast on the grass was my favorite, captured as the early morning sun warmly filtered through the leaves and moss of this 300 year old landmark, with gorgeous beams of light washing over the couple as they shared a kiss... it was one of those kinds of pictures that I knew, right as I composed it and pressed the shutter, was going to be particularly special. 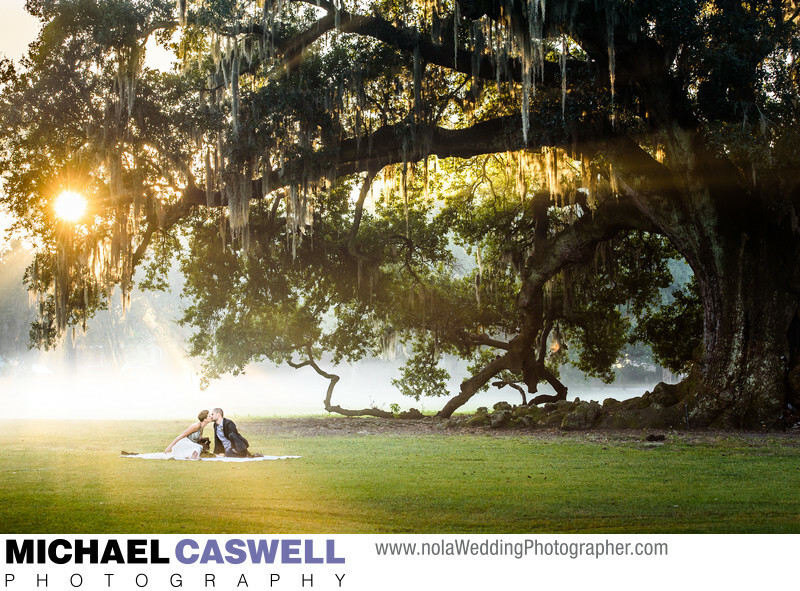 I've been contacted by couples planning to elope to New Orleans who saw this image and thought for sure that it was an example of embellishments being added with Photoshop, such as the mist and the beam of sunlight. While, as is the case with every picture I capture, I did do a bit of editing to enhance the overall look of the image, this is a real photograph that accurately represents the scene as it appeared that morning, and is a great example of how a skilled photographer can capitalize on a particularly fortunate set of circumstances to create a memorable picture.